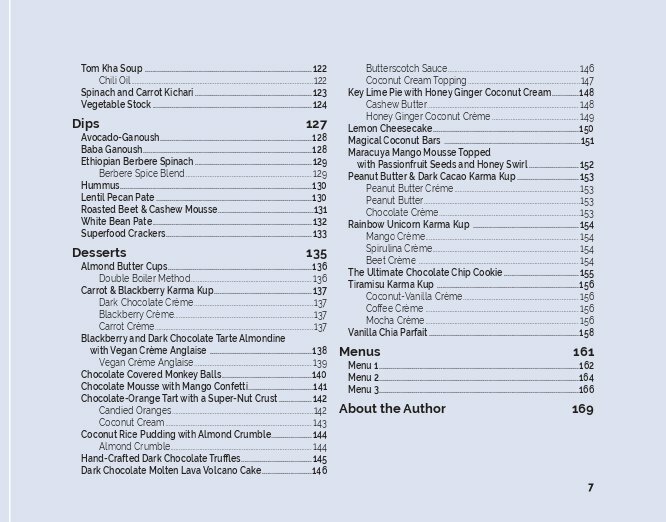 The Gaia Gourmet Hardcover Cookbook offers over 120 precise recipes for easy replication by the novice home cook or newly venturing plant-based chef. These recipes have been tried, tested and continually refined for several years at our kitchen at The Sanctuary at Two Rivers in the jungles of Costa Rica. Now we are making them all available to the world in an effort to share high-vibration wonderfully tasting vegetarian, vegan, and gluten-free gourmet cuisine. 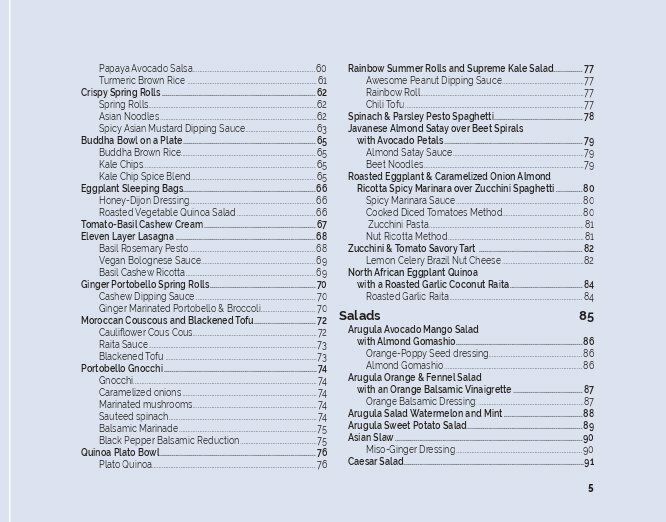 In the back of Gaia Gourmet there are three sample weekly menus that we serve to our retreat guests and yoga teacher training students. 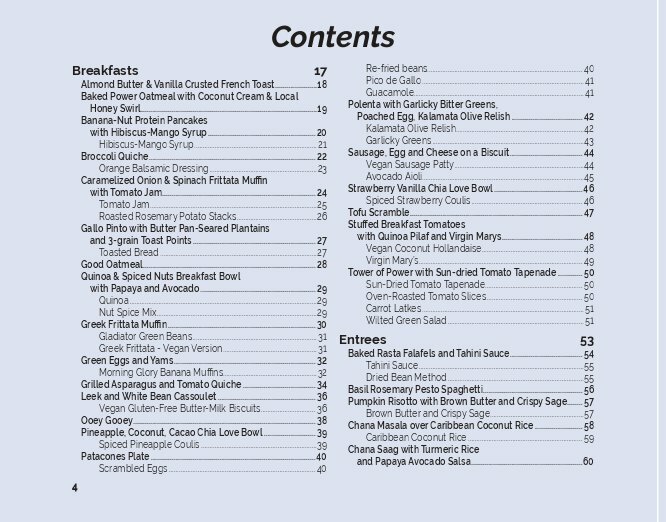 You can actually use this cookbook as a guideline or template for any health, wellness or yoga retreat center or even base your own restaurant around these scripted meal plans. The recipes offer plenty of latitude and versatility if you wish to mash-up some up into new creations. At GaiaGourmet you can ask for guidance or advice if you need any assistance re-creating these dishes. Buen provecho! 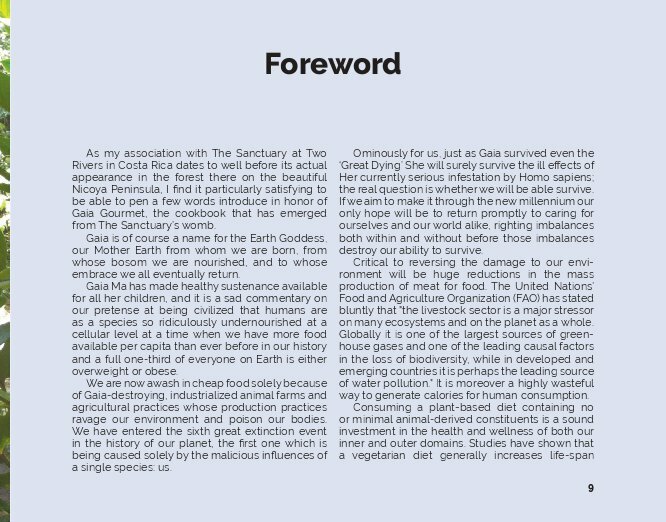 As my association with The Sanctuary at Two Rivers in Costa Rica dates to well before its actual appearance in the forest there on the beautiful Nicoya Peninsula, I find it particularly satisfying to be able to pen a few words introduce in honor of Gaia Gourmet, the cookbook that has emerged from The Sanctuary’s womb. Gaia is of course a name for the Earth Goddess, our Mother Earth from whom we are born, from whose bosom we are nourished, and to whose embrace we all eventually return. Gaia Ma has made healthy sustenance available for all her children, and it is a sad commentary on our pretense at being civilized that humans are as a species so ridiculously undernourished at a cellular level at a time when we have more food available per capita than ever before in our history and a full one-third of everyone on Earth is either overweight or obese. We are now awash in cheap food solely because of Gaia-destroying, industrialized animal farms and agricultural practices whose production practices ravage our environment and poison our bodies. We have entered the sixth great extinction event in the history of our planet, the first one which is being caused solely by the malicious influences of a single species: us. Ominously for us, just as Gaia survived even the ‘Great Dying’ She will surely survive the ill effects of Her currently serious infestation by Homo sapiens; the real question is whether we will be able survive. If we aim to make it through the new millennium our only hope will be to return promptly to caring for ourselves and our world alike, righting imbalances both within and without before those imbalances destroy our ability to survive. Critical to reversing the damage to our environment will be huge reductions in the mass production of meat for food. The United Nations’ Food and Agriculture Organization (FAO) has stated bluntly that "the livestock sector is a major stressor on many ecosystems and on the planet as a whole. Globally it is one of the largest sources of green- house gases and one of the leading causal factors in the loss of biodiversity, while in developed and emerging countries it is perhaps the leading source of water pollution." It is moreover a highly wasteful way to generate calories for human consumption. Consuming a plant-based diet containing no or minimal animal-derived constituents is a sound investment in the health and wellness of both our inner and outer domains. Studies have shown that a vegetarian diet generally increases life-span while lowering the risk of coronary heart disease, the number one killer in the world today. Chef Naga is a self-trained Plant-Based Chef. In 2001, after having profound life-realizations while on a 10-day silent Vipassana meditation retreat, Naga became a vegetarian. 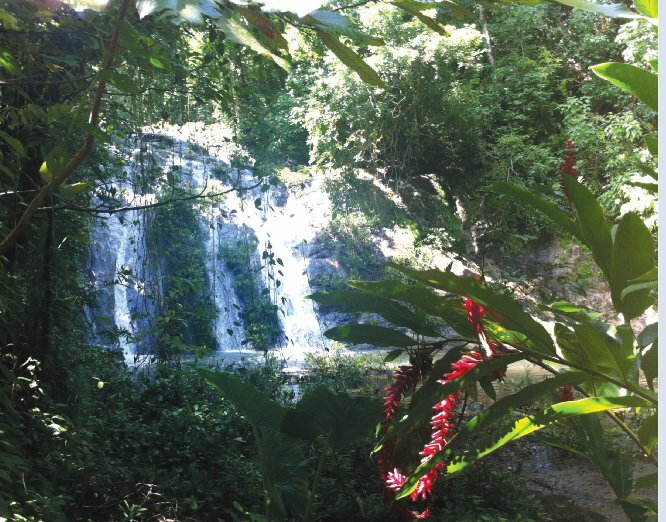 As his sadhana developed in the fields of Yoga and Meditation Naga found himself co-creating The Sanctuary at Two Rivers, an eco-conscious yoga retreat and teacher training center 100% off-the-grid in the jungles of Costa Rica. Inspired by a love of world cuisine and meditation, Naga embarked on a spiritual journey to learn about one’s true Self and debunk the myth that vegetarians solely eat steamed vegetables and brown rice. Chef Naga developed and honed his meditation and culinary skills by embracing the Empirical scientific method of running experiments, analyzing data, adjusting accordingly and repeating again and again. 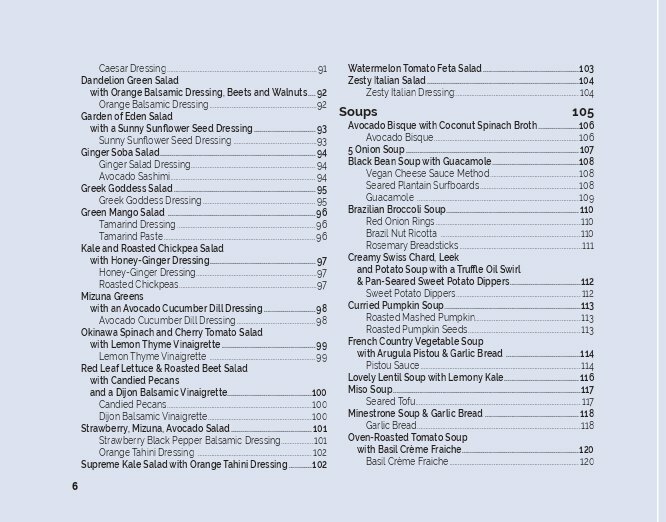 The results of this refinement process are multidimensional vegetarian and vegan dishes with rich and complex flavor profiles as well as gluten-free vegan desserts that are nutrient dense and plate-licking amazing, not to mention a fairly focused yogi. For those interested in learning from the chef himself visit www.gaiagourmet.com for culinary internships and cooking retreats. 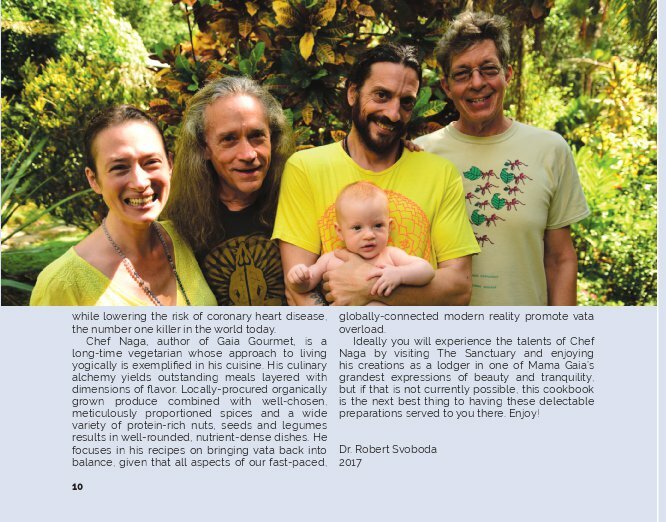 Naga teaches his students to embrace the cooking process similar to that of their spiritual practice, whereby continually refining one’s focus and awareness one gains the ability to probe more deeply into any melody of flavors as well as develop one’s insight, intuition and imagination, necessary tools for enlightening one’s spiritual journey. For those interested in experiencing this cuisine firsthand please visit www.thesanctuarycostarica.com for their calendar of yoga retreats and yoga teacher trainings.